High humidity will start in late spring in Nebraska – it’s already here! – and stick around until cold winter winds blow in. That’s why BDB Waterproofing recommends that you install a dehumidifier in your basement or crawl space. Because they remove moisture from the air, dehumidifiers can make your air conditioning run more efficiently, and keep your house cooler over the summer. Here are four more good reasons for running a dehumidifier in your home. Household dust mites can also cause allergy-related symptoms and trigger asthma attacks. They grow best in warm, humid areas. By running a dehumidifiers, you will lower the overall humidity in your house, which helps to eliminate the environment which helps dust mites thrive. Humidity levels play a part in determining the quality of air in your home, as do the amount of toxins that you may or may not be breathing in, according to AllergyAndAir.com. “While there’s no denying that an air purifier is the most effective way to cleanse the air of potentially harmful substances, a dehumidifier does indeed play an important role in improving your indoor air quality,” they said. Mold flourishes in moist, damp air where the humidity is 50%-65%, according to AllergyAndAir.com. It. If it grows to large quantities, it can become a health risk, and can contribute to asthma attacks. It can also break down materials. Eye and throat irritation, skin rashes, sneezing, itchy throat and/or coughing are symptoms of mold allergies. Certain pests love humid environments, according to Karl Rowell, Quality Assurance and Safety Manager at Batzner Pest Control. “These include silverfish, millipedes, centipedes and cockroaches,” he says. “In extremely humid cases, mosquitoes and fleas could also start to breed. ” A dehumidifier can help keep these pests outdoors where the belong. BDB Waterproofing installs Santa Fe dehumidifiers for moisture control in basements and crawl spaces. They are energy-efficient, and some models serve as air filters, too. They can be set up to empty collected water down an existing drain, or into the sub-floor drainage system. Either way, there’s no need to empty a pan. Cover dirt floors in crawl spaces with a plastic vapor barrier. BDB Waterproofing can assist with crawl space encapsulation, too. Keep air-conditioning drip pans and drain lines clean and unobstructed. 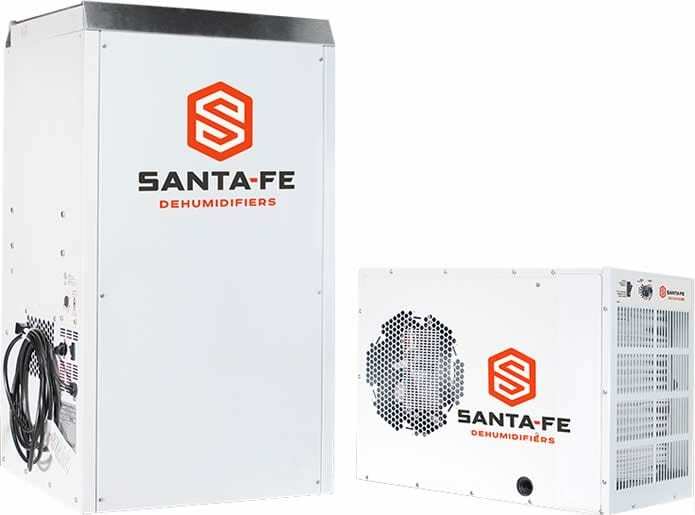 For more information about Santa Fe dehumidifiers and installing them in your basement, call BDB Waterproofing at 402-779-3165, or use the form on this page to contact us online for a free estimate.